AMHERST, N.Y. – Daemen College recognized the outstanding achievements of graduating students in the Daemen College Class of 2016 at the college’s Annual Excellence Awards Ceremony held May 20 as part of commencement weekend activities. “We extend congratulations to these exceptional students and commend their many accomplishments in the classroom, on campus, and in our community,” said Daemen President Gary A. Olson. Ramel Haines of Bronx - Mary Angela Canavan Award, which recognizes an undergraduate student who has made significant contributions to the betterment of student life at the college. He earned a bachelor’s degree in business administration. Christopher Ponichtera of Depew – Alumni Senior Award, which recognizes an undergraduate student who has demonstrated exceptional dedication to the larger community. He earned a bachelor’s degree in physical therapy. 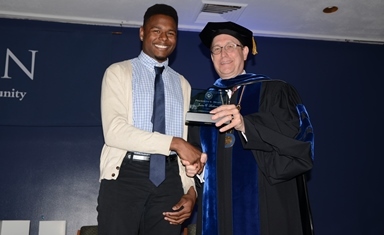 Justin Richmond of East Stroudsburg, Pa. - President’s Award, which recognizes an undergraduate student who has exhibited dedication, care and concern for their fellow students. He earned a bachelor’s degree in childhood and special education. Daemen College Tradition Keeper: The DC Book Medal – Jessica Maulucci of Tonawanda; Maria McGrath of Penfield; Holli Nesbitt of Rochester; Mark Poblocki of Akron; Christopher Ponichtera of Depew; Kelsey Reeder of Livonia; Amanda Smith of Amherst; and Kelsey Zahno of Wilson.